Choosing a location for your summer mission trip can be a challenging task. If you and your group are still deciding on where to serve with us this summer, San Augustine might just be the perfect location for you! Next Step been serving in San Augustine since 2014, and each summer we have continued to see God work in miraculous ways through this special community in rural East Texas. I fell in love with San Augustine the very first time I visited- from the warm welcomes, unbelievable southern cooking, to the powerful community vision. There is no doubt that this place is one of a kind. Like any community, San Augustine has strengths as well as challenges. San Augustine faces many economic and physical challenges such as poor living conditions and rising poverty. Partnering with this community provides an opportunity to build long lasting change in a big way. This is where you come in. Each year we have countless community members request for help on home repair projects that would hugely impact their lives. You and your team can be a part of building hope in a community by repairing a roof, building a wheelchair ramp, fixing a home, or even working on a full build. 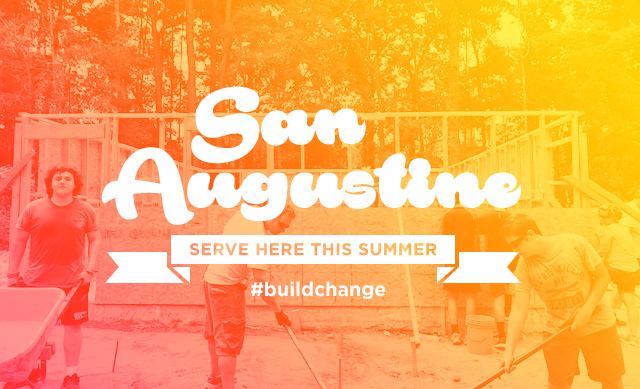 Come be a part of the big impact change in San Augustine by serving on a trip with us! One of the coolest reasons to serve in San Augustine on your mission trip is the relationships you can build with the homeowner you are serving alongside. If your youth group is excited about big impact construction projects and being a part of relational ministry with homeowners, this is the perfect trip for you. The homeowners we partner with are eager to get to know you- often joining for lunch, helping with the project, or participating in a devo! When Next Step was invited to partner with San Augustine, we were inspired by the vision of revitalization and reconciliation in the community. Community leaders have aspirations to not only see the standard of living raised through home repair and building, but also to see their community unite together. San Augustine County, like many, suffers with disunity from neighborhood to neighborhood, which leads to pockets of hardship and tension. But beyond the physical poverty, there is also a struggle against relational segregation that San Augustine County faces. We are humbled to be asked to be a small piece of the puzzle in working towards racial reconciliation in San Augustine. By joining us on a trip to San Augustine, you have an opportunity to not only learn about deeply rooted segregation that can exist in a community, but also be a difference maker as the community strives to see reconciliation and unity. Next Step plays a unique role as a bridge builder between people experiencing division. We have an awesome opportunity to be a positive presence in the community that can give people something to have in common, instead of another thing to separate people. each summer hundreds of youth groups from all over the country come to serve in a small rural town in east Texas, all to share the love of Christ. People in San Augustine are energized and excited by Next Step coming alongside their community to build lasting change and hope. The community is excited to host Next Step groups and build relationships each week with trip participants. They are eager to share the unique and wonderful part of their community, from joining us on a free day to the lake to offering a free Grapefruit High Ball treat at the local Drugstore. Homeowners often ask about groups that worked on their homes, keeping cards and letters from trip participants far beyond the summer. San Augustine understands what it means to build genuine community and they invite you and your group to be a part of their community far beyond a week long trip. One of the most unexpected things about coming to serve in San Augustine is the ways you can be inspired in your own faith by seeing the ways community members display theirs. By many standards, it is easy to look in from the outside and view many community members in San Augustine as not having very much. In reality, they have so much because their faith in God is great. We have the privilege of working with and learning from community members whose lives are radically changed by the love of Christ. Many past trip leaders have shared with us that their students came back from their trip to San Augustine inspired by the ways they witnessed great faith in unexpected ways from seeing their homeowner provide a generous meal for their crew, to sharing about their unshakable trust in God despite the adversity they face. Excited to be a part of the amazing things happening in San Augustine? Sign up for a trip HERE!